Skills and Abilities: Proficient hand to hand combatant, tracker and infiltrator. Powers: He has “calamari” for limbs’ arms and legs; this allows him to stretch them, shape them etc little nerves on his arms and legs make him a low level pre-cog. He also has a measure of enhanced strength. Equipment: He wears a power suit with a variety of different devices. The Helmet grants him thermal vision, built in communicator allows him to stay in radio contact with the H.I.M base, language translators are also on board allowing him to download languages as needed. The suit also has a wifi link with H.I.M base for instantaneous updates for combat situations. He carries with him a Gun called the “turkey leg” which puts people to sleep. Lastly he also has a backpack for hovering/flight. Eric Townsend was a famous s a movie actor. His plane went down along with the director while promoting his last movie “The Hit Manny”. It is unknown how he survived but he found himself changed with his appendages now that of octopus tentacles which he could stretch and shape at will. He became an agent working for H.I.M; The humanoid Interaction Management. He became famous in some circles though he kept his identity secret form everyone even those he works closely with. He has gone on numerous missions saving countless lives all while he tries to make sense of his new place in the world [Jack Kraken One Shot]. ← Genius New Mini series from Image Comics! I dig the Kraken/octopus aspect along with his abilities and the “Turkey Leg”, but not totally feeling the costume only cause it doesn’t feel as original as the character himself. 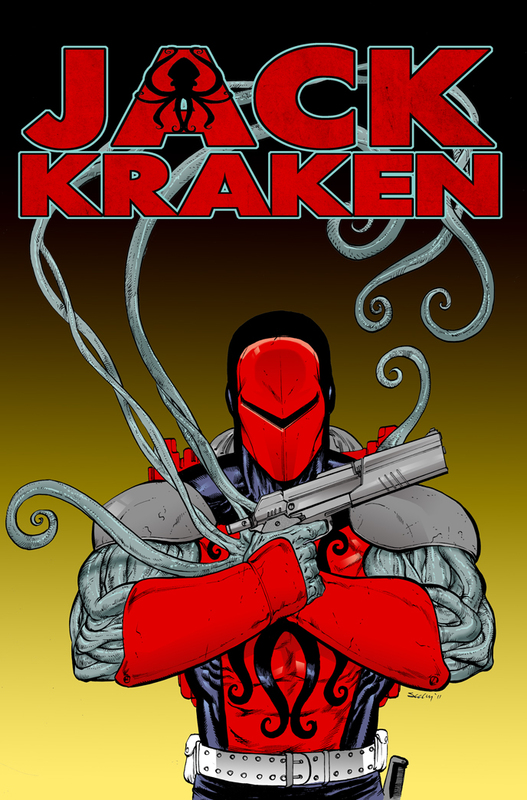 Maybe it’s just me, but the Kraken emblem on his chest reminds me of Spider-Man and the color scheme reminds me of Night Thrasher and Deadpool. Not saying there’s anything wrong with that or that I’m just another internet complainer, just an honest opinion of a black comic fan who would like to see more black heroes that aren’t being tied to other heroes. Noted Courtney! Now that you mention it I do see the similarities to Thrash and pool!